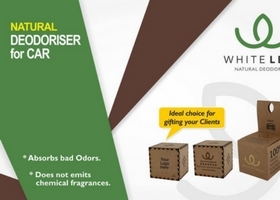 WHITE LEAF is 100% natural, organic, emits no fragrance, recyclable and economic as well (absorbs all odour and plastic fumes rather than masking it). Air freshener mask and to extent usage contaminants in it cause you headache, allergy, asthma, cancer, impotency and other discomforts. In addition, plastic parts inside your car also start emitting benzene fumes when car is parked under sun. One of the basic properties of activated carbon or charcoal is absorbing odour molecule in the air around it. Addition to it, it has tendency to leave off odour molecule when exposed to temperature difference. As car being naturally exposed to temperature rise and variance, keeping the raw activated carbon or charcoal inside the car will not solve the purpose. With our years of experience and expertise in application, we applied the process to make activated carbon attain equilibrium state, which won't leave off, absorbed odour molecule even when exposed to higher temperature differences. 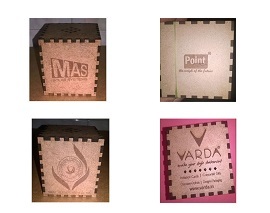 The branding can be done as per the various images attached herewith and for larger quantities even the outer box can be customised as per your requirements. The life of the product is 6 months from the date of opening of the wrapped protective polythene cover. 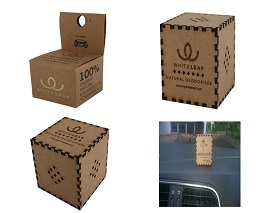 WHITE LEAF is 100% natural, organic, emits no fragrance, recyclable and economic as well (absorbs all odour and plastic fumes rather than masking it). Air freshener mask and to extent usage contaminants in it cause you headache, allergy, asthma, cancer, impotency and other discomforts. 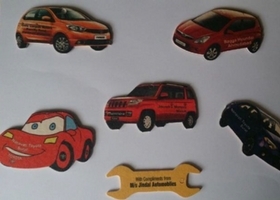 In addition, plastic parts inside your car also start emitting benzene fumes when car is parked under sun.